Alfred Ernest Dipper was born at Green Farm in Apperley on 9th November 1885. One of ten children, he was educated first at Deerhurst School and then at Tewkesbury Grammar School. Alf learned his cricket at Apperley Cricket Club, later moving on to Tewkesbury Cricket Club where his talent was spotted and he was chosen to play his first cricket match for Gloucestershire against Kent in 1908. He turned professional, aged 23, in 1908 although it wasn’t until 1911 that he could really command a place with Gloucestershire. For many seasons Dipper was the sheet anchor of the Gloucestershire side. His only Test appearance was in 1921 at Lord’s against Australia. He scored 11 and 40. He played his last game for Gloucestershire in 1932 against Somerset at Bath. On his retirement from the first class game he became an umpire. He died in London in 1945. 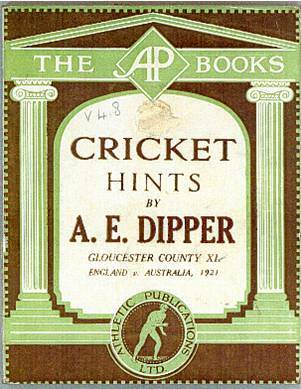 Alf Dipper wrote a book called "Cricket Hints" which contains some interesting reflections on the game and on his cricketing experiences, including his days as a young cricketer at Apperley. Alf Dipper came from a long established local family who had been farmers in Apperley and Tirley for several generations. Whether I was a cricketer born or not, modesty forbids me to say, but Apperley near Tewkesbury is after all, in the county of the Graces, and my home was within a stone’s throw of the village pitch. Small wonder then, that my earliest recollections of things finite centre round the cricket field. On the further side played the seniors, the giants of the game, and we, the little boys looked upon them with awe what time we piled our coats for stumps and tucked up our meagre shirt sleeves over our equally meagre arms.